1.1 'We' 'Our' 'Us' mean Pro Print Solutions Limited. 1.2 'You'/‘Your’ 'the Buyer' means the Customer including any Director of a Limited Liability Company, a Partner of any partnership or individual who has signed our Sales Order Form. 1.3 'Goods' means the items of equipment, furniture, stationery, accessories or service as requested by you from us (including any instalments of goods or any part or item for use in or on the goods). 1.4 ''Service'' includes hiring or otherwise using goods belonging to us or supplied to you under any form of credit agreement by us or any agent or linked financial provider. 1.5 'Writing' includes telex facsimile or other similar means of communication including e-mail and other electronic form. 1.6 “Standard” when referred to contract type and changeover means service shall be offered within our core business operational times (i.e. Monday to Friday, 09.00 to 17.00, exclusive of weekends and bank holidays). 1.7 “Duration” of the standard maintenance contract is for five years. 2.1 We will supply and you will purchase the goods in accordance with any written quotation produced by us and accepted by you or any written order made by you which we have accepted subject in either case to these conditions which shall govern the contract to the exclusion of any other terms and conditions. 2.2 No variation to these conditions shall be binding unless agreed in writing between the authorised representatives of us and you. 2.3 Should the customer or authorised assignee of the customer purport to terminate this contract, or refuse to accept delivery of the equipment under the terms of this agreement, then Pro Print Solutions Limited shall be entitled to make a cancellation charge to the customer not exceeding 25% of the price which You agree is a reasonable charge to make in the circumstances of Your premature and wrongful termination reflecting the additional administrative burden and our loss of profit. 2.4 Any typographical, clerical or other such error or omission in any sales literature, quotation, price list, acceptance of offer, invoice or other document or information issued by us shall be subject to correction without any liability on our behalf if it is a mistake of fact by us. 3.1 The cost of the goods and/or services shall be our quoted price. All prices quoted are valid for 30 days only. 3.2 The price is exclusive of value added tax (vat) which shall be due at the rate ruling on the date of our invoice to you. 3.3 Payment of the price and vat shall be due on delivery of the goods or supply of service to you, or immediately if you refuse delivery of the goods or any part of the goods. 3.4 If you fail to make payment on the due date then without prejudice to any other right or remedy available we shall be entitled to cancel the contract or suspend any further deliveries or provision of its services. 3.5 Where you are to supply us with a meter reading for the use of any equipment or machinery and fail to do so within 7 days of our written request we can estimate the amount to be charged and invoice you accordingly but if it subsequently appears that this is an incorrect figure we will be entitled to amend and rearrange the invoice for a further demand or give you credit for any over payment as required and for this purpose we can carry out a meter reading. You will allow us access at all reasonable times to affect such a meter reading. 3.6 The times for undertaking maintenance work are our normal office hours only and exclude weekends and Bank Holidays: any work outside this time can be charged by us at our additional rates if we are willing to undertake the work. 3.7 The price does not include any maintenance for the equipment following completion of delivery, installation and commissioning unless the copy charge/annual maintenance section is completed. The customer may if he so wishes enters into a separate agreement with Pro Print Solutions Limited for such maintenance. 4.1 Time for delivery shall not be of the essence unless otherwise agreed by ourselves in writing. Any dates quoted for delivery of goods are approximate only and we shall not be liable for any loss caused by delay in delivery of the goods however caused. 4.2 Should you fail to take delivery of the goods or fail to give us adequate delivery instructions, then without prejudice to any other right or remedy available to us we may: a) store the goods until actual delivery and charge you reasonable or actual costs of storage (including insurance) or; b) charge you a cancellation fee not exceeding 25% of the price. 4.3 If you require us or agree to use a carrier for the goods then delivery shall be when the carrier collects the goods from us and all damage in transit shall be your responsibility for which you should insure. 5.1 Risk of damage to or loss of the goods shall pass to you at the time of delivery or if you wrongfully fail to take delivery of the goods then at the time when we offered delivery of the goods. 5.2 Even after delivery and the passing of risk in the goods, the property in the goods shall not pass to you until we have received in cash or cleared funds at our bank, payment in full of the price plus vat. 5.3 Until we are paid in full plus vat, you will hold the goods as our agents and bailee. As such, we shall be entitled at any time to require you to deliver up the goods and if you fail to do so, we can enter upon any of your premises or any associated business of yours where the goods are stored and re-possess the goods; we can then re-charge you any costs or expenses incurred by us. 6.1 This agreement in respect of service can be terminated by you 60 months after the Installation Date or on any subsequent anniversary of that date if you have given at least 90 days prior notice in writing to Us. 6.2.3 Have maintenance, repairs or consumables carried out on or supplied in connection with the Equipment by anyone not authorised by Us. 6.4 If you constantly exceed the manufacturers recommended monthly volumes for the equipment, We may at our option either give you notice to terminate the agreement or increase the Cost per Print payable by You to a sum which We reasonably consider reflects Your actual use of the Equipment. 6.5 Unpaid for or unused Consumables remain our property. You must keep them in a safe place and available for Us to collect at all times. All unused Consumables must be returned to us when this Agreement ends. For the avoidance of doubt this includes unused consumables contained within the equipment. 6.6 You may not withhold payment of any invoice or other amount due to Us, even if You allege You have a claim against Us or a right of set off. 7.1.1 Where the number of prints Used on average over the period since the Installation Date does not exceed the amount of prints included within the quarterly charges, compensation will be the actual average number of prints Used per quarter multiplied by the current Cost Per Print, then multiplied by the number of quarters remaining on the agreement under clause 6.1, less a 35% discount. 7.1.2 Where the number of prints Used on average over the period since the installation Date exceeds the amount of prints included within the quarterly charges, compensation will be the actual average number of prints Used per quarter multiplied by the current Cost Per Print, then multiplied by the number of quarters remaining on the agreement under clause 6.1, less a 35% discount. 7.1.3 If no quarterly charge is applicable, compensation will be the average number of prints Used per quarter multiplied by the current Cost Per Print, then multiplied by the number of quarters remaining on the agreement under clause 6.1, less a 35% discount. 7.1.5 You agree that 65% of the costs is a fair and accurate assessment of our loss as it represents the gross sum You would otherwise pay to Us less 30% which represents our operating costs and less a further 5% being a discount to You because we will receive payment sooner than we would have done if the Agreement had not been terminated. 8.1 We warrant that the goods will correspond with their specification and will be free from defects in material and workmanship at the time of delivery. 8.2 This warranty is given subject to the following conditions a) we shall be under no liability in respect of any defect in the goods arising from any drawings, design or specification supplied by you b) we shall be under no liability in respect of any defect arising from fair wear and tear, wilful damage, negligence, abnormal working conditions, failure to follow our instructions (whether oral or in writing) misuse or alteration or repair of the goods without our approval. c) We shall be under no liability if you have improperly installed or used the goods or any software or accessories/peripherals whether or not supplied by us or if you refuse delivery of the goods or any part. d) if you relocate re-configure or upgrade any equipment which is subject to any maintenance by us you must notify us in writing at least 30 days prior to such relocation and any existing maintenance agreements and/or service agreements and/or warranty on site agreements for those goods shall continue at our discretion only. 8.3 We will be under no liability under the above warranty if the total price of the goods has not been paid by the due date for payment. 8.4 This warranty does not extend to parts, materials or equipment not manufactured by us; as such you shall only be entitled to the benefit of any such warranty or guarantee as is given by the manufacturer to us. 8.5 Any claim made in respect of any defect in the quality or condition of the goods or supply of service by us or their failure to correspond with specification shall be notified to us within 7 days from the date of delivery or supply of service or after discovery of the defect or failure. If delivery is not refused by you and you fail to notify us accordingly, you shall not be entitled to reject the goods and we shall have no liability for such defect or failure and you shall be bound to pay the price if the goods have been delivered or service provided in accordance with this contract. 8.6 We shall not be liable to you by reason of any representation or technical advice (unless fraudulent) or any implied warranty, condition or other term, or any duty at common law or under the express terms of the Contract for any indirect, special or consequential loss or damage (whether for loss of profit or otherwise) costs, expenses or other claims for compensation whatsoever except in respect of death and personal injury caused by our negligence, which arise out of or in connection with the supply of goods or their use or re-sale by you or supply or service by us and our entire liability under or in connection with the Contract shall not exceed the price of the goods. a) act of God, explosion, flood, tempest, fire or accident; b) war, or threat of war, sabotage, insurrection, civil disturbance or requisition; c) acts, restrictions, regulations, bye-laws, prohibitions or measures of any kind on the part of any government, parliamentary statutory or local authority; d) strikes, lock-outs or other industrial action or trade disputes (whether involving our employees or employees of a third party); e) difficulties in obtaining raw materials labour, fuel, parts or machinery; f) power or electrical equipment failure or breakdown in machinery including Software. 8.8 When supplying services, servicing repairing and/or when installing any goods we shall be under no Liability for any loss of software data and/or other information contained stored or kept in or on your goods nor for your administration or Operational time or savings. It is your responsibility for the preservation and retrieval of all such software data or information. 8.9 Any software support is limited to telephonic diagnosis and support only which is chargeable after the initial period stipulated in the order and any additional support whether on your site or goods returned to us shall be chargeable at our then stated rates. Such software support cannot guarantee a resolution of the problem where this is outside the scope of a reasonable technical engineer, in particular where you have a bug, software or application conflict within your goods even if found by us at a chargeable site visit. 8.10 We are not liable to support or repair any computer networked system of yours arising out of a failure of the goods supplied by us after the initial installation unless this is specifically stated in a separate support contract. 8.11 Pro Print Solutions Limited may alter the cost of services for any year following the initial year. 8.12 Remote Access may be included if relevant hardware and access via ISDN or the Internet is available, this may be used for the added provision of fault finding, remote monitoring and re-configurations. Remote reconfiguration may only be done on the agreement from Pro Print Solutions Limited and the recipient. Re-configuration work will only be done without charge as part of the contract when deemed necessary to aid resolving a fault. Any other reconfiguration request from the recipient will be subject to costs. Pro Print Solutions Limited reserves the right to quote for an onsite visit if reconfiguration work cannot be done effectively and/or safely via a remote connection. 8.13 Software or hardware upgrades, patches, service packs, enhancements, installation and routine administration functions are not included within the scope of this contract. 8.14 In the interest of customer security, certain equipment and configurations belonging to the recipient with the recipient’s agreement may require that Pro Print Solutions Limited withhold direct access to equipment via password or alternate protection. The recipient may then be given access to the equipment only via a signed written request. Access to any equipment belonging to Pro Print Solutions Limited will be withheld at the discretion of Pro Print Solutions Limited. 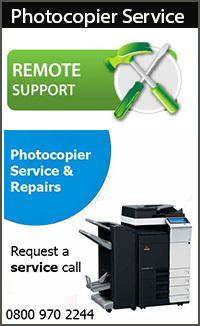 8.15 Support on non-Pro Print Solutions Limited supplied software or equipment interacting with, installed on or connected to any equipment supplied by Pro Print Solutions Limited is not included. Work required when a problem is due to errors caused by software not supplied by us, or when service is required due to changes or upgrades to the network operating systems, application software or as a result of any other errors, viruses or similar events will be charged at the standard rate of Â£65.00 per hour. 8.16 Technical support calls will, where possible, be responded to within a target response of 4 hours from the time of a call being logged. This response can include leaving a message for a return call in the event that the recipient is unavailable. This response time may not be met in the event of telephone problems or engaged lines either at Pro Print Solutions Limited, Recipient’s premises or within any central communications network, Response may also be impaired in the event account suspension due to default of payment for this support contract purchased from Pro Print Solutions Limited. As such the response time is not guaranteed. 8.17 Pro Print Solutions Limited reserves the right to withhold or cancel the support agreement in the event of account suspension due to default of payment terms for this support contract purchased from Pro Print Solutions Limited. 8.18 Service charge. We will invoice you for the service charge as set out in the pricing schedule. We will use the meter reading to work out how many copies you have made. We will do this either: a) By you giving us a meter reading when you have requested toner.b) By one of engineers taking the reading when he has serviced the equipment.c) By us requesting a meter reading from you. d)Pro Print Solutions Limited have a minimum usage charge on all its Digital Print equipment of up to a maximum of Â£50 per quarter where your use of the equipment yields income of less than Â£50 per quarter . Charge increases. We can increase the charges set out in the pricing schedule by giving you 30 days written notice. There will be an automatic price increase on the anniversary of the installation date. The new charges will apply from the last meter reading taken prior to the new charges coming into effect. 8.19 Pro Print Solutions Limited undertakes during this agreement to service the equipment in accordance with the terms and conditions of this agreement except when the repair is necessitated by: a) A fault due to the customers error.b) The equipment being damaged due to accident, neglect, misuse by owner, acts of God, failure or fluctuation of electrical power or causes other than ordinary use.c) The equipment being tampered with by the customer or other party. The above faults or damage which are outside Pro Print Solutions Limited’s service liability under the agreement may be repaired by Pro Print Solutions Limited at a price applicable at the time. The equipment may be replaced at the option of Pro Print Solutions Limited for any length of time at Pro Print Solutions Limited’s discretion with similar equipment, which will also be subject to the terms, and conditions of this agreement. 8.20 In the event of a fault reported to Pro Print Solutions Limited which is found to be a fault external to the equipment then Pro Print Solutions Limited reserves the right to make a responsible additional call out charge, for example mains supply faulty. 8.21 Pro Print Solutions Limited cannot be held responsible for the maintenance or software support of any computer network during or after the initial installation of a networked copier unless this is specified under a Computer Maintenance Contract with Pro Print Solutions Limited. 8.22 The scope of this contract does not cover computer interface devices such as RIP’s, Fiery’s, fax boards, scanners and any other devices which facilitate network connectivity unless covered by a separate maintenance contract. Software support is not covered unless the relevant software maintenance package has been purchased. 8.23 Where the equipment is networked we will invoice a network peripheral and support charge of Â£9.95 per month after the twelve months warranty period has expired. This will provide printing and scanning support. If you do not wish to take this cover, then you will charged on a time and materials basis of Â£65 per hour for on site visits and Â£30 per hour for remote support. 8.24 Toner inclusive contracts are based on a print coverage not exceeding 5% on black copies and 5% per colour (total coverage 20%) on colour equipment. We reserve the right to re-negotiate CPC charges should this criteria be exceeded. A3 copies are charged at a nominal rate of 2 x A4 copies. 9.1 If we incur any loss or costs under this contract because of your fault you shall indemnify us against all loss, damages, costs (including legal costs) and expenses awarded against or incurred by us in connection with these conditions (even if this is a small claim dealt with by arbitration). 10.2 If clause (10.1) applies then without prejudice to any other right or remedy available to us we shall be entitled to cancel the Contract or suspend any further deliveries or services under the Contract without any liability by us to you. 11.1 If we should waiver any breach of the terms of this Contract incurred by you, this shall not be considered a waiver of any subsequent breach of the same or any other provisions. 11.2 If any provision in this contract is held by any competent authority to be invalid or unenforceable in whole or in part, the validity of other provisions in this contract and the remainder of the provision in question shall not be affected. 11.3 If you fail to pay us as agreed and we take steps to recover outstanding amounts we shall be entitled to add to the invoiced price or money outstanding at any time any interest or charges which we incur including Court costs legal fees and debt agency fees. 12.1 If for any reason outside our control performance cannot be given by us we shall be entitled to cancel this contract by writing to you and we shall not be liable for any loss claim or expenses you may incur except to return any payment made to us by you or on your behalf for the goods or service not supplied if you have not then any outstanding account with us, and otherwise we can offset any such credit from any such debit balance.